From the concept, to the initial design work, to the circuit schematics and planning, to the building and testing (including testing by Slash himself), you can follow the progress of the AFD100 on the net. 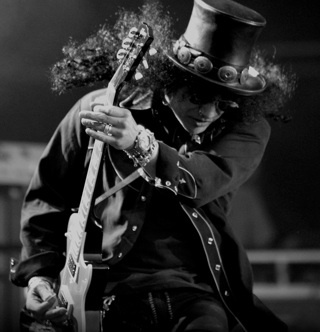 Marshall promise video content, news, blog entries as well as interviewers with the designers, the builders and, of course, the man himself – Slash. Regarding the amp, itself, Marshall tell us that the amp used by Slash on Appetite was a JCM 800 2203. What makes things a little more intriguing however, is that the amp was actually rented for AFD and had been ‘modded’ before Slash got it. The story goes that Slash liked it so much that he ‘forgot’ to give it back to the rental company who had to, eventually, come and steal it from the studio. In a splendid, folklore-type ending, the amp has since vanished. Marshall and Slash will work together to unlock the mysteries of this magical amp and, hopefully, unleash it on us amp-buying, tone-hounds next summer. Keep an eye on the AFD100 site to track it’s progress.